Although most of the country was enjoying a nice sunny day it was cold in Worthing (and the coast in general) due to an annoying freezing mist that had been hanging around all day. The #TeamSmashingItIn2013 contingent of Trevor, Danny and I donned our gloves (Trevor and I) or long sleeved top (Danny) and approached the start looking forward to having a go at a flat 5k rather than the usual hilly Hove Park parkrun. I wanted to get close to the 19.30 mark as I need to do this at Hove Park and it is good for confidence to have done it somewhere flatter first (re Preston Park tester parkrun). I noted two ladies who I felt would beat me but decided to attempt to follow Lauren as I sneaked past her once at parkrun. Trevor had told Danny he wasn’t good enough for top 10 so he was primed to prove him wrong. Off we went! It was a little windy on the westerly outward stretch. I couldn’t believe how quickly the leader passed me on the way back as I was still on the way out! He must have been on for 15 minutes by the looks of it. I saw Danny in third place and Trevor on his way back as I approached the turning point. I got there in 10.05 which was a little bit worrying but as I was now running with the wind behind me and didn’t feel tired I was pretty confident I could make up time for another sub 20 finish. I could still see Lauren around 50 metres ahead and made an effort to reel her in. Unfortunately she must have been accelerating at the same pace as I didn’t get any closer to her. Blast! I know I should have stuck with her on the outward leg but it was too late to rectify that error now so I just kept working and put in a nice little sprint finish to clock 19.35 (ish – no results out yet) finishing within 10 seconds or so of Lauren hopefully. Alas there were only prizes for 1st place so my second and Danny’s third yielded nothing but he smashed a new pb of 17.17 (by his watch) and I was pleased with my 19.35. Trevor was around 20th I reckon so a good showing by the #TeamSmashingItIn2013 crew. 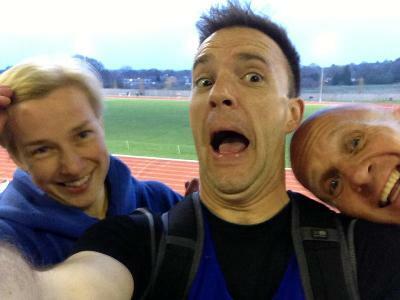 On Thursday it was time for the merry trio to have a go at a track mile in Crawley as I had (foolishly) promised that we would all win something as there was hardly anyone there last year. Arenas on tour: Looking good at the K2! Of course everyone had had the same idea so there were probably around 20 people on the start line including some rather speedy looking men. Danny had forgotten his watch so was feeling a bit naked and anxious. I had a plan of going for sub 6 by sensibly attempting 22 second 100s, or 90 second laps which sounded pretty reasonable and doable. There was no clock on the track but luckily I had remembered my watch. Everyone set off like mad folk but I made sure I didn’t get sucked into going off too fast and arrived at 100 metres in precisely 22 seconds (seems my pace judgement has improved). I reached 409 metres in 87 seconds so only a smidgen too fast but felt comfortable so just kept going. I didn’t feel overly dead at any stage so just tried to keep me form and carry on. I did get lapped by the two leaders but that was unsurprising as they were doing about 4.16. I managed to throw in quite a windmillish sprint finish and stopped my watch on 5.58. Phew! I must be pleased though as I did exactly what I planned and got the sub 6 which was the aim. 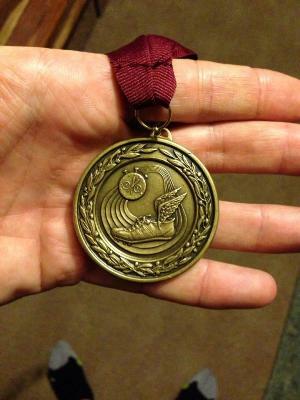 I was also second lady so added a medal to my (miniscule and generally unworthy) collection. Another one for the jiffy bag at the bottom of the shoe cupboard! Danny won bronze for the vet men. Trevor alas won nothing. We felt a bit mean as he had driven us all the way there. I made him a chocolate medal as a consolation prize! On Friday it was Rat Run time once more. Trevor, Kevin, Ivan and I were this week’s only participants. It was a short one incorporating 4 car parks including the 17 storeys at Churchill Square. On reaching the top we were greeted by a massive rainbow. Good times. Then we sped back down like windmilling goons. After a quick stop in The Caxton we ran back to Withdean for the traditional post Rat Run carvery. A nice little 7 miler. 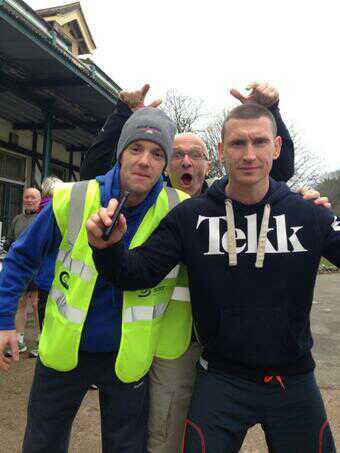 Then it was parkrun time again. It was rather cold and windy. Brr! Bring back spring please. I set off in pursuit of Paul as is my current tactic as it has worked well thus far even though he gets away from me from 2k. Nothing much to report, managed to keep the pace from the first k of 3.55 and reached 4k in 15.55 ish I think so knew another sub 20 was in the offing. Was slightly annoyed to discover I had run 19.41 again! Though actually that is good as I didn’t feel like I was concentrating as much as usual and still equalled my pb, also the conditions were a bit poo. I am still full of unpleasant chesty wrongness and snot so hopefully when I am finally free of such green yuck I may be faster. Today there was a memorial run for Sam Brighouse who died at the Brighton marathon and the victims of the Boston marathon bombings. Trevor decided it would be good to run from Withdean to the run at the base of Grand Avenue, then run back for our second carvery in three days. It was a lovely sunny day for an easy run. There was a good group of around 100 people gathered for the run. We all took a gentle jog to the Marina and back then Trevor, Kevin, Jake, Sam and I ran back to Withdean and scoffed yet more carvery. This made another 12 miles to add to my weekly total. Monday arrived. Thus track. I knew I had to stay in the group I was in last week. Caroline wasn’t there to follow this week but Pete was. As he had also done the 100 mile relay practice the day before we decided to drop back slightly from the speedier section of our group. The session was 4 x (3 x 300 + 800). We were doing the 300s in a leisurely 70 seconds and the 800s in around 3 minutes. Not in any way speedy but consistent and plenty after Sunday’s long run. Perfect pacer Pete made this possible so thanks! On Tuesday I went to Core & Stretch as usual knowing it would do my poor legs good after my sudden jump to speedyishness. We focused on hamstring and calf stretches for the first half of the class which was perfect for me. We then blasted our abs for a bit and finished off with the dreaded (well, my dreaded) hip flexor bridge thingies. I still can’t lift my legs on this one and have to just stay in the basic shoulder bridge position. I think my hip flexors are just too damned tired from all this running. It was a good class though and my legs felt much less tight by the end. In the evening I did a fastish 5 in preparation for Splashpoint 5k on Wednesday evening. I decided that this week I wouldn’t do spin at all to give my legs a (tiny) break. I did however go out for a slow run in the morning instead. This evening I am doing the 5k with Danny and Trevor. I think it will be a pretty low key affair and will be interesting to see what I can do on a flat course. 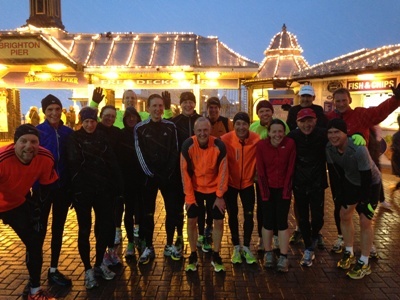 Thursday rolled around again (as it is wont to do after Wednesday) which meant it was Hove Park intervals once more. As Kevin and Jake were joining us for the first time I even got a lift to the park so I could show them where to go which meant I should be ready for a good session after not having run there or on Wednesday evening. This proved to be the case when I found myself ahead of many people I have never been ahead of before. We started with 2 x (1k, jog, 750m) then continued with some smaller, faster loops round the paths at the top of the park. Steve said he’d run with me which meant he ran two steps then hared off into the distance never to be seen again. Standard. I didn’t mind as it meant I could focus on what I was doing without getting sucked in to someone else’s pace. After dashing around the small loop and walking up the hill as recovery 5 times it was time for the session to end. It’s been a while since I’ve just done the session without running there and back so it was only 4 miles for the bank but 4 more nonetheless. On Friday it was time for spin. I found it rather hard. Not surprising really. We did a section of backwards hill climbing which nearly killed my legs off totally but I managed to complete the session, albeit somewhat more feebly than usual. Parkrun rolled round once again. I wasn’t feeling particularly up for it but knew I had to attempt to go sub 20 again as I am still worried it was a fluke thus far. It was quite windy up the back straight and seemed very busy even though it was slightly quieter as PrestonPark parkrun had its first run today. Now an old pro (snigger) I started on the start line with the plan to follow Paul for as long as possible again. We got stuck in an almighty tangle of limbs at the start so I was battling not to kick Paul (or anyone else for that matter) which made it hard to get into a good rhythm and I reached 1k in 3.55 ish (3.49 last week). Ad the ks ticked down it was looking a bit dicey but I kept pushing and reaching 4k in just over 16 I felt it was just about doable. Somehow it was still really congested over the last k and I wasted valuable seconds weaving in and out of runners and untethered dogs, children etc. However I still managed to throw in a fast finish to bring me home in 19.52. Thank God for that! I was quite pleased as I really hadn’t felt up for it. So that’s 3 sub 20s in 10 days. Amazing really as I didn’t think I’d ever actually achieve it. This morning I went out with some of the 100 Mile Relay crew (I’m not actually doing it) as they were practicing legs 4 and 5. This meant a hilly run of around 13 miles over the downs. It was a lovely day for running. Sunny but cool. My hands were ridiculously cold. Rubbish circulation. Shorts and T shirt weather finally though. Fired with enthusiasm and motivation after my two sub 20s (did I mention I ran two sub 20 5ks in three days last week?) I decided it was time to move up to Caroline’s group at track. This seemed rather scary but I told Caroline it was my plan so I couldn’t back out. I also dragged Andy into the group as his usual sub group wasn’t there. Not sure he thanked me! Anyway, it was time to see how I would fare. The first set of 3 x 300 with 100 jog between was a good start as it is just my cup of tea so I knew at least this part would be fine. It was! 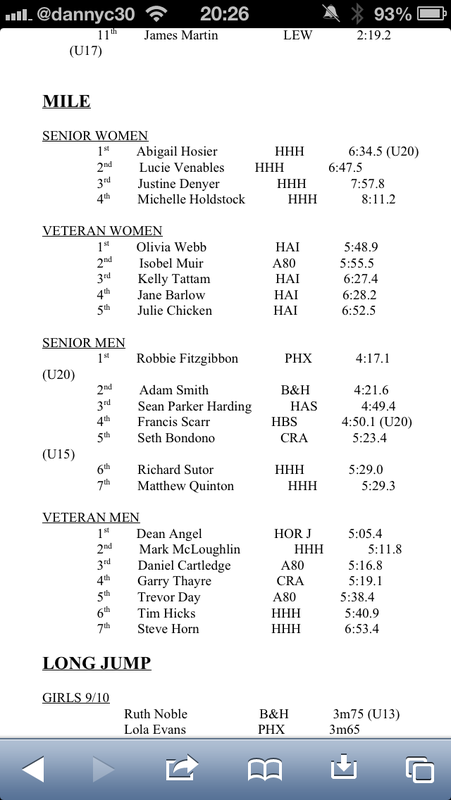 Then Bob told us the next bit: 5 x 800 (400 tempo, 400 fast) 75 seconds between reps. Ut oh! This was just the sort of thing I didn’t want to hear! However in my newfound confidence I got stuck in. I tried to keep as close to Caroline as possible throughout. She got away from me a bit towards the end but I was still in touch with the group and even discovered when others were bent double at the end of the reps I was able to remain upright and not overly puffed. Think our reps were all just under 3 minutes. Amazing. Goes to show what having even a modicum of confidence can do. A few months, even weeks, ago I would never have even considered the possibility that I could run in this group and yet here I was sticking with the pack and not finding it massively hard (of course it was hard but I was still standing). After the 800s it was back to 3 x 300 which I found fine, even keeping up with Paul and Steve on the second rep. We finished the session with an all out 800. By this stage I was blatantly knackered so only managed a rubbish 2.58 but who cares? I had survived (mostly) unscathed a whole session with the almost-elite group! Now I’ve done it once I’ll have to stay in that group forever. Yikes but yeeehhhhhaaaa!! Finally everything is coming together. Just goes to show perseverance pays off. Five long, hard, horrible, dogged-by-mental- illness years of carrying on even though I felt awful and was running really badly have transformed suddenly into how I have always known I should be running. Then it was Destroy Self Tuesday again. This week I went to Core & Stretch first before killing off my arms. It probably helped though I didn’t really notice much difference. The class was good as always and really helped stretch out my poor neglected legs. After the class I went upstairs and gave my arms a good thrashing. In the evening it was out for a run with Danny. As he has just run a 3 hour marathon the run was just a gentle recovery run. This suited me too after my sudden jump to fast(ish) running over the last week. We were doing just under 9 minute miling and I did around 6 miles so a nice gentle introduction back to longer running. A good day though not really full of destroyage! This morning I felt the need to go long having not done it for ages and knowing I couldn’t make the evening run as I’m going out (to something non running related? What the?) I set out aiming for 10 miles but got swept up and ended up doing 13 miles. Nice and slow and easy though so it was fine. First time I’ve done a half without my hips and buttocks dying around 11 so shows I am getting stronger. All in all another good week (so far). The main breakthrough being a sudden surge in confidence (easy to surge from none to a bit). I’m nowhere near Madame Confidence 2013 but at least I feel like I can finally get on with my life and running without being held back by the crippling lack of self esteem I have been dragging about with me for 35 years! Well there wasn’t a snowstorm but the weather was poop nonetheless! Wet, wet, wet and cold. Luckily Pete took pity on me and picked me up as he drove past. We then set off super early. Regrouping at the Peace Statue we discovered hardly anyone was there. Not surprising really as most of the group are running the marathon, or if not, being sensible and not dragging themselves out into the horrible weather. Anyway we completed the run whinging and moaning in the traditional style. Pete gave me a lift home too so only did an easy 6 but this was good as I knew I had the tester Preston Park parkrun on Thursday evening where I intended to finally (though unofficially) go sub 20. The day started off a bit dismally, cold and wet but the forecast promised it would dry up later and for once it was right! I got a lift over to the park with Andy and it was dry and not windy so great conditions for going for the fabled sub 20. We were a little worried at first as there didn’t seem to be any faster people to follow (I hate not knowing where I’m going) but as the start time drew near a few speedies appeared as if by magic so I felt a bit less anxious. I had planned to stick as close to Andy as possible as he consistently runs 19.50s. I also wanted to pace myself, rather than being dragged along by others, or lagging behind slower folk. I started on the actual start line, again. Still feels weird! Then we were off! The course starts with a nice little downhill so I sailed down it happily feeling good that I was running somewhere other than Hove Park. I passed 1k in 3.55 ish I think which felt comfortable. A good thing about the course is that is based on three smallish laps which meant I could see all the k markers on the first lap which made me feel calmer that I knew whereabouts I would be at various points. I was still comfortably just behind Andy and Paul as we came round for the second lap, and the third… Could it really be that I would FINALLY break the elusive 20 minute barrier? As each k passed and I was still under 4 minute kilometring I began to believe it would really happen. I pushed on knowing that there was a tiny bit of hill to the finish and conscious that I mustn’t lose it having come so far. I was still just behind Andy and Paul at this stage. I did a traditional speedy finish and just pipped Andy to the post and ended up a few seconds behind Paul. From my watch I had managed 19.50! As Danny was timing I asked him what he got which was 19.46. Hoorah!!!! I am A8680 – 19.47, 6th place, first woman. Oh happy days! But not really of course! I felt that I needed to do it “properly” at Hove Park on Saturday. Blasted woman! Five sodding years and then I finally do but immediately set myself a new target without even a pause to appreciate what I have achieved. The psychological barrier had been broken though so I was secretly confident that I could do it again on Saturday. In the meantime I had a spin class to contend with on Friday. Thank goodness there were three other people there this week! This didn’t stop the class from being knackering as always. Made especially so coming after a hard week of running. Jeff told everyone that I was to blame for the contents of the class as he based it on what I had written in my blog. Oh dear. Whatever I had written it translated into lots of climbs, sprints and climbing sprints. Sorry everyone! D day rolled around and it was time to show HovePark parkrun what is what after 5 long years of failure! I decided to give Kevin and Trevor a break from chauffeuring me and cycled over as it wasn’t raining or stupidly windy. I took myself off for a lap warm up after helping Trevor set up the finish funnel. For the third time in a week I stood right on the start line and didn’t feel too traumatised. Everyone behind me would just have to run over me! The plan this time was to try and keep with Paul but once again also trust my own pacing. As I passed 1k in 3.49 (!) I was a little worried that I had gone mental and would blow it but quickly dismissed the thought and kept going. Paul was increasingly drawing away from me but I didn’t panic and just hoped he was being extra speedy. As Andy passed me I was a little more worried but I managed to stick with him, just about, and the times being shouted at the k markers (and my watch if I had looked at it…) reassured me that I was still on for sub 20. I kept repeating to myself as the ks ticked down, all under 4 minutes, that I mustn’t lose it now so when I reached 4k in 15.50 something I felt that I could do it as my last k is usually 3.40 ish anyway as the end is in sight! As I reached the final time shout around 40 seconds from the end and it was 19.08 I knew I had finally done it! I put in as much of a sprint finish as I could conjure up and crossed the line in 19.45 (my watch). A good 20 second pb! Thank God for that!!!!!!!!!!!!!!!!!!!!!!!!!!!!!!!!!!! Being a parkrun regular I managed to get a sneaky early look at the results and was pleased to discover I had run 19.41. A 27 second pb and finally on the sub 20 list! I also discovered that Arena had swept the board by being first three men and women. All in all a marvellous morning for the Arena posse. This morning it was time for the Brighton Marathon which meant I had to be up early to help set up in zone 2. I quite enjoy watching the race but have no desire whatsoever to run it. Loads of Arenas out. Check out Danny and Rob’s blogs which will be full of tales I’m sure! Monday rolled round once more which meant the inevitable track session. Thankfully the weather was behaving itself slightly, although it was still quite cold and the gloves were still on. I wasn’t sure how my legs would be feeling after two back to back fast runs at the weekend. I joined my usual group and set off on the first rep of the session. 7 x (2 x 500) @ 2 minutes per 500 with 100 jog between 500s and 2 minutes between sets. We were completing the reps precisely in 1.59. When we reached the third set I felt that I could go a little faster so I decided to latch on to Andy’s group who were just ahead of me. They proclaimed to be doing 1.50s so I girded my loins and set off with them. It was fine! I managed to complete the rest of the session with them without too much trouble. Surprising but good. I must stop underestimating what I can achieve. On Tuesday I started off the day of destruction (as Tuesdays are now known) with the killing of the arms. This consists of 4 different exercises at the gym where I do 3 x rep to failure on biceps, triceps, whatever else one has in the arms and shoulders… This alone would be fine but I then go to Core & Stretch class which involves a lot of down dogging (oh Lord, not again…) and planking and other stuff that requires arms and shoulders of steel. I know this is why Toby said I should just do two of the arm exercises after the class but I like to get it over with beforehand so it is my own fault the class is now even harder on wibbly spaghetti arms. I managed it though and felt I also gave my core a good thrashing (it was probably already somewhat thrashed after 3 days of fast running). After this the destruction continues by going to Tesco. This must surely be counted as cross training? The final element of the day is the run containing a fast final mile with Danny in the evening. As he tapering for the marathon (doing a very fine job of it I may add) he left me to it on the mile. I can’t say it was very successful. It felt really hard, I was weaving about all over the place and my form was a disaster but it was probably still sub 7 minute miling and after the preceding three hard runs I suppose it is acceptable. It was also rather windy and some days are just not as good as others and this was such a day. The rest of the run was around 8mm which is a good pace for me so all in all another good training run. This morning I didn’t go to spin as I think I need a little rest, although I will be going out with the Arena posse later for a nice long one on the seafront, hopefully without attendant snowstorm this time. It was rather windy and still freezing as I set off for the Arena run. I was of course still wearing many hundreds of layers though I had downgraded to only three quarter length leggings (still three pairs) but still two pairs of socks, gloves, ear flaps etc etc. There was a light flurrying of snow as I joined Kevin and Trevor jogging to the start. We were unimpressed. However this was NOTHING compared to what was to come! As we neared the pier the most ridiculous (the word de jour) snow storm erupted out of nowhere. The flakes were massive, soggy and freezing and were coming at us horizontally off the back of a freezing Arctic wind that had sprung up miraculously. In the midst of the ridiculous snowstorm. Which somehow has totally evaded capture in this photograph! Thanks Danny for taking it though. Too cold to be getting phones out to take pictures! At least when we turned at the pier the storm would be behind us pushing us home. NOOOOOOOOOOOO!!!!!! It was still horizontal into our faces. This is not even possible yet it was happening. Unamused. We thrashed our way back to the King Alfred, Pete and I moaning all the way (even more so than usual). As soon as we got there the snowstorm stopped and the wind dropped and everything became vaguely normal again. A very odd and unpleasant run! As the clocks have changed HovePark intervals now start from the top of the park. This means shorter reps and grass hills. Hoorah! Except it was still utterly freezing which isn’t befitting of summer training. Huff. However Bob wasn’t deterred and set us off on some loops up, down and around the wiggly path and the grass hill (overrun with BMFers). I felt pretty good and got stuck in. The second part of the session was 20 x Kenyan hills up the grass hill. I felt that I would be there until the end of time, it seemed to take forever. Not sure how many I did in the end. Maybe 17. It was a good session though and I was pleased with my effort. Rested on Friday as I wanted to have (yet another) go at sub 20 at parkrun on Saturday (even knowing that Caroline would be unhappy as I was running Mel’s Milers 10k on Sunday). The day dawned sunny but still exceptionally cold and rather windy. Ho hum. The plan was to trust my own pacing (as advised by Danny). This went wrong almost immediately when I saw the sub 20 pacer was standing directly in front of me. I thought this must be an omen so set off after him. Mistake! I stuck with him pretty much until 3.5k where he drew away from me up the long drag by the playground. Grrrrrrr!!!! I was mightily annoyed with myself as I let him go and could see Charlie, Andy, Rick and everyone else I know runs sub 20 just ahead of me. I tried to pick it up again in the last k but by then it was too late and I rolled in frustratingly in 20.08, equalling my pb. 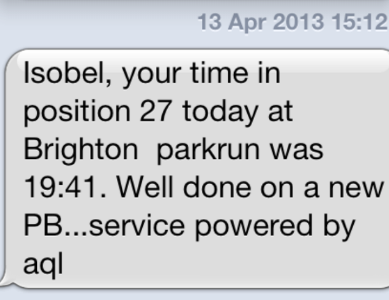 The sub 20 man then apologised for pacing it badly which is exactly why I should have trusted my own pacing. I seem to think just because someone has a Garmin and has written “I’m pacing sub 20” on a piece of paper and pinned it to their back that they must know better what they are doing than I do! Stupid woman! Oh well, one day I will learn. And I did! This morning it was Mel’s Milers 10k. My second trip to Christ’s Hospital in a week. This time the day was sunny, (relatively) mild and not too windy. I took the opportunity to wear shorts as I loathe running in leggings (especially three pairs). Kept my gloves on though. After a little warm up with Anne and Jim and a quick chat with Mark and Bob it was time! I lined up right on the start line which was very weird and made me rather anxious but then we were off! As we stretched out through the grounds I counted that I was 5th woman (wrongly as it turned out…). Thus when I overtook two ladies just after 1k I was pleased to be (not) in second position. As I was trusting my own pacing I kept going as I had promised myself to start fast (but sensible) and see what happened. I passed 1k in 3.46 which meant the marker was definitely in the wrong place! Going through 2k in 7.31 and 3k in 11.06 made me equally suspicious but I tried not to let it get to me and just kept pressing on. Passing 4k in 16.01 and 5k in 20.20 made more sense (though still suspiciously fast). Somewhere along the line it straightened itself out – 6k 24.41 7k 29.14 8k 33.25 9k 37.54 10k 41.41… The race was excellent. 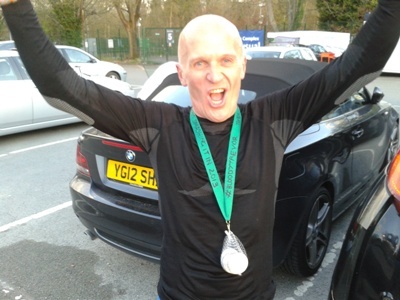 I felt that I paced it properly, concentrated and pushed the whole way round, didn’t stay behind people who were running too slowly for fear of overtaking them and generally ran as I always felt I should have but hadn’t managed thus far. I don’t think I got overtaken by anyone and passed 3 or 4 men from 7k onwards which was pleasing. I had Terry from Phoenix in my sights who I have never previously been anywhere near so decided to try and reel him in over the last few kilometres. I managed to get past him about 200 metres from the end! Bob was taking photos around this point and told me I was third lady. As I thought I was second this was slightly disappointing but still 3rd place is better than I have ever placed in anything as an individual and I knew my time was going to be pretty good so I sailed merrily over the finish line in a hail of glory (only my own, no-one else could give a hoot). I was approached by a marshall at the end who told me I had won a prize so I had to give him my name to add to his prize winner list! The results were posted immediately on the side of a van so I was pleased to see my time of 41.41. A pb, though not really a pb as it is a multi terrain event it cannot be accurately measured (so said Bob). But no matter! 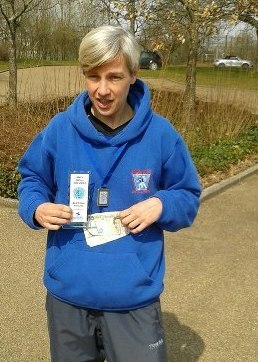 I was very pleased with my run and the fact I actually won something!